RF wavelength calculations can be made quite simple with two basic formulas. One for feet and the other for meters. 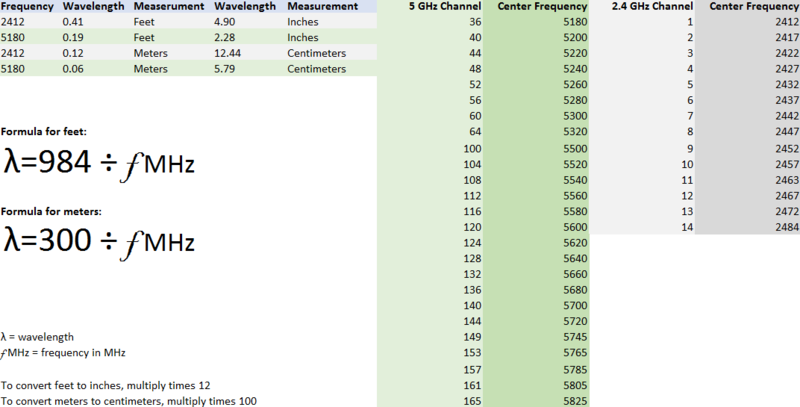 This blog post provides the formulas and an Excel spreadsheet for calculating the wavelengths for each 20 MHz channel center frequency in the 2.4 GHz and 5 GHz bands. The length of RF waves impacts antenna design decisions. Antennas should be designed so that they best receive in the frequencies intended. This means understanding the wavelength of the RF waves generated in a given frequency. 802.11 channels work on a center frequency. The image below shows the spreadsheet available here, which also shows the center frequencies for each 20 MHz channel in 2.4 GHz and 5 GHz. These formulas are shown, more scientifically, in the image above. Download the spreadsheet and take a look at the result for the different center frequencies using the drop down boxes provided in the Frequency column. Download the Wavelength Calculator spreadsheet.